Planning a wedding can be very fun, but wedding costs are high and it can be easy to get carried away and go way over your budget. The last thing you want is to spend the months after your wedding having to pinch pennies because you overdid it on the wedding planning. This is why it is very helpful to use a wedding budget planner. A budget planner is a simple calculator to help you categorize how you are using your budget and visualize where your money is going. Using a budget planner can help you plan the wedding of your dreams while staying within your budget. We have two versions of a helpful Wedding Budget Planner template: the free budget template and the premium budget template. Quick Start: Add the total amount of your wedding budget into the “Add Your Actual Budget” field in the box at the top left of the template. 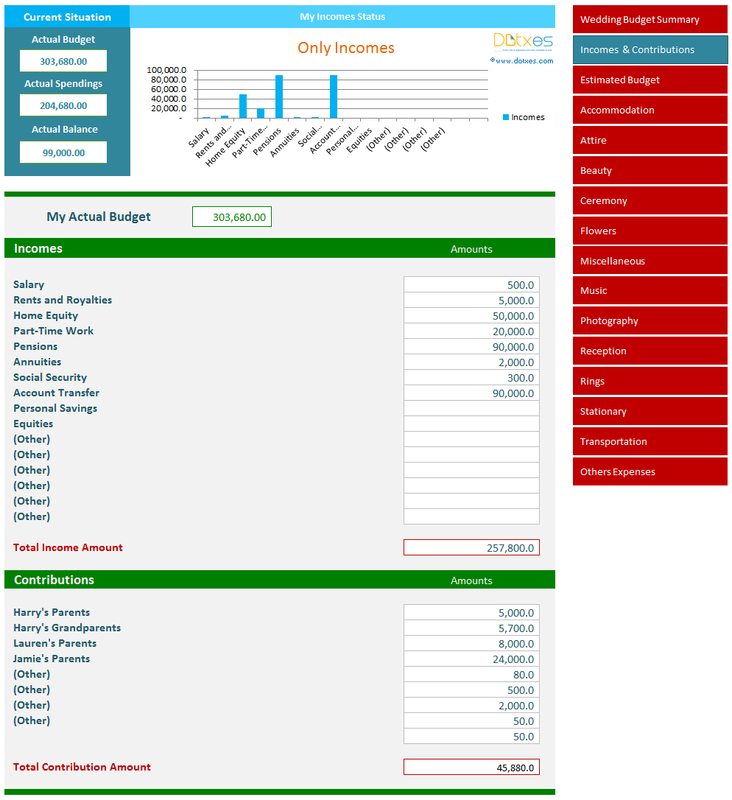 Your template is now ready to calculate all expenses within your budget. Category Tabs: Template contains tabs for each category so you can easily add your estimated and actual expenses and you’ll be able to easily compare both. These will also provide the values of paid and due amounts. 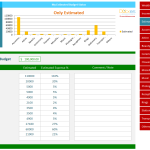 Graph Chart Reporting: Template will automatically analyze your budget and show you the percentage of your budget that each category uses via graph chart so you’ll know which category is taking up the most of your budget. Budget Summary: The “Wedding Expenses Summary” tab will show you the estimated and actual expense amounts, the percentage of used budget for each expense, and the amount paid and due to various expenses. Income and Contribution Sheet: Template contains a sheet to include other income in your budget, such as paychecks during the budget period, or money gifted to you by family members. 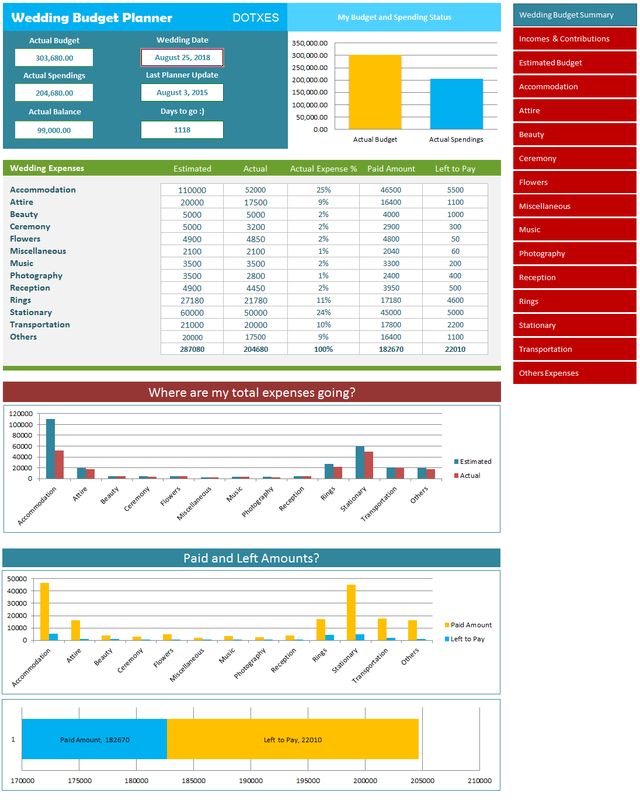 Also contains a reporting tab and graph chart to visualize your various sources of income. Simply add these in and the template will automatically add them into your total budget. Expense Category Sheet: Allows you to separate each expense category into its own sheet so you can add your estimated or actual expenses for each. 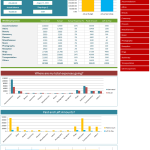 The sheet will automatically deduct your expenses and show your remaining budget. Also shows a visual representation of each specific category so you can see how much of your budget is being consumed by each individual expense in a specific category. 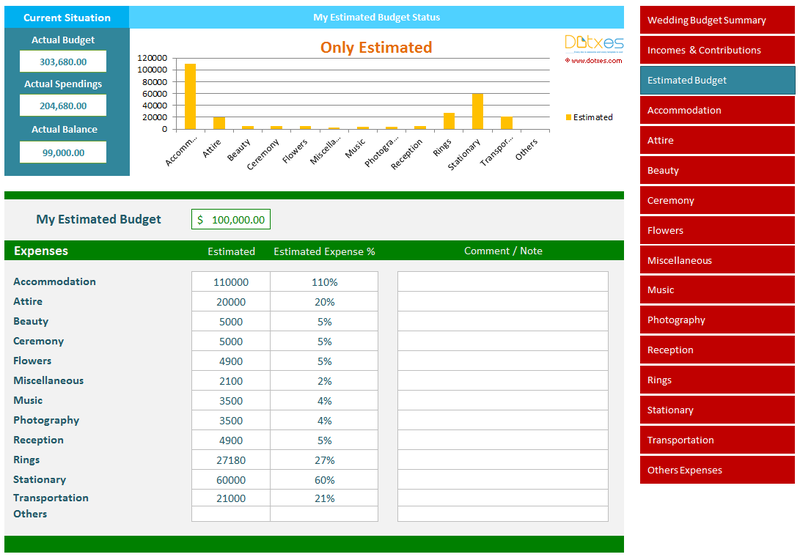 Estimated Budget Sheet: These tabs will show you the total of the estimates from all categories. These can be entered into each category or sub-category sheet. 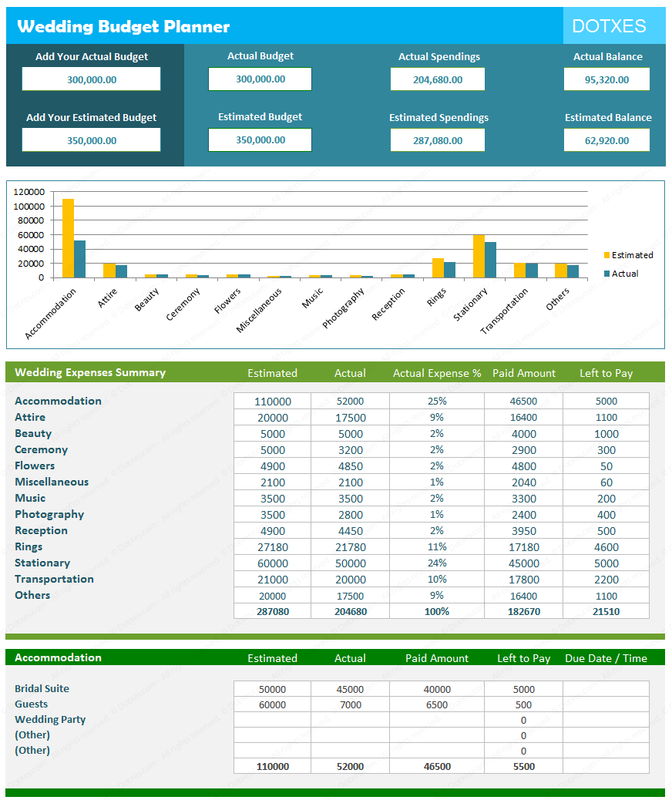 On this sheet, you can analyze the amount of budget spent per category. **Note: you cannot enter values directly into these tabs. Other Expenses: If you incur an expense that is not already listed in one of the existing sheets, you have the option to create your own sheet for that expense and you will be able to see the reporting for that sheet separately, as well. 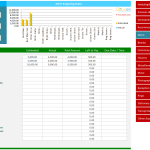 Budget Summary: This sheet will show you the overall reporting of your budget usage according to your entered data. 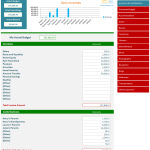 You will be able to see the report of total, estimated, and actual expenses. You can see the actual percentage consumed by each category and the totals of paid and outstanding amounts for each expense category. The summary contains a graph chart to neatly visualize where each expense fits into your budget. 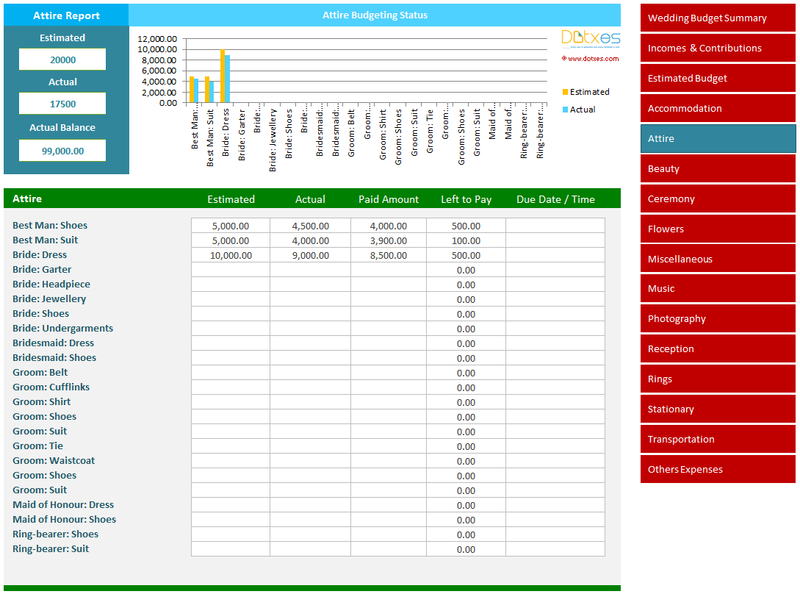 Here you will also be able to compare the estimated and actual expenses. The summary contains a second graph chart to show your total completed and outstanding payments and will also allow you to compare these amounts by category. Easy Navigation: Premium version contains buttons to easily move from sheet to sheet. There is a simple navigation guide on the right side of the template and you can move from one sheet to another with a single click. Wedding Date Countdown: Add your wedding date to the “Add Wedding Date” field at the top of the template on the “Wedding Budget Summary” sheet and each time you view your template it will display the number of days left until your wedding. Remaining expanse sheets work with the same features as mentioned in “Attire” worksheet.